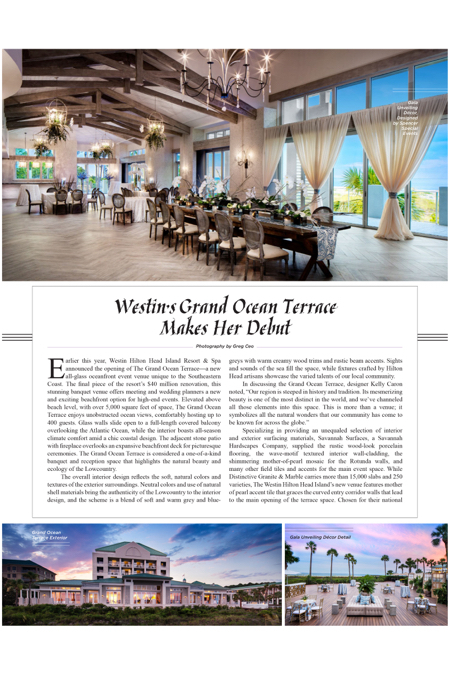 Earlier this year, Westin Hilton Head Island Resort & Spa announced the opening of The Grand Ocean Terrace—a new all-glass oceanfront event venue unique to the Southeastern Coast. The final piece of the resort’s $40 million renovation, this stunning banquet venue offers meeting and wedding planners a new and exciting beachfront option for high-end events. Elevated above beach level, with over 5,000 square feet of space, The Grand Ocean Terrace enjoys unobstructed ocean views, comfortably hosting up to 400 guests. Glass walls slide open to a full-length covered balcony overlooking the Atlantic Ocean, while the interior boasts all-season climate comfort amid a chic coastal design. The adjacent stone patio with fireplace overlooks an expansive beachfront deck for picturesque ceremonies. The Grand Ocean Terrace is considered a one-of-a-kind banquet and reception space that highlights the natural beauty and ecology of the Lowcountry. The overall interior design reflects the soft, natural colors and textures of the exterior surroundings. Neutral colors and use of natural shell materials bring the authenticity of the Lowcountry to the interior design, and the scheme is a blend of soft and warm grey and blue-greys with warm creamy wood trims and rustic beam accents. Sights and sounds of the sea fill the space, while fixtures crafted by Hilton Head artisans showcase the varied talents of our local community. Specializing in providing an unequaled selection of interior and exterior surfacing materials, Savannah Surfaces, a Savannah Hardscapes Company, supplied the rustic wood-look porcelain flooring, the wave-motif textured interior wall-cladding, the shimmering mother-of-pearl mosaic for the Rotunda walls, and many other field tiles and accents for the main event space. While Distinctive Granite & Marble carries more than 15,000 slabs and 250 varieties, The Westin Hilton Head Island’s new venue features mother of pearl accent tile that graces the curved entry corridor walls that lead to the main opening of the terrace space. Chosen for their national reputation, Lowcountry Originals provided unique lighting fixtures, incorporated into the design of the Grand Ocean Terrace, that could dazzle on their own, and many include locally sourced oysters, also used throughout the terrace design. In addition to providing a visual channel connecting guests to all the natural beauty of the Lowcountry coast, malleable and “eco-first” design elements allow the typical border between indoors and outdoors to vanish. • The overall structure features deep roof overhangs, extensive porches and shaded terraces to both reduce heat gain and create natural cooling, while providing additional protection from the elements. • The operable glass walls create an open-air feel and provide natural ventilation, generating gentle cross-breezes to increase comfort. • The exterior features turtle-friendly lighting and beautiful landscaping that buffers the impact of the structure and promotes dune stability. • The storm and rainwater runoff system is designed to be self-contained, ensuring no erosion occurs to the beach or surrounding areas. These factors and more provided the foundation for The Westin Hilton Head Island Resort & Spa to welcome its first wedding guests to the newly completed Grand Ocean Terrace on May 27. The exclusive oceanfront venue hosted over 200 wedding guests to an unforgettable evening of unobstructed ocean views to ensure a “coastal chic” state of mind. Elevated service from our consistently proven events managers and highly regarded banquet teams, along with the culinary stylings of award-winning executive chef Ed Connors ensured that each service element matched the glorious atmosphere of the space. Not to be outdone, the resort hosted a joyous gala unveiling for dozens of high-profile wedding editors, leading industry bloggers, wedding professionals and area dignitaries. On June 27, events included a kick-off cocktail reception on the picturesque Oceanfront Deck, followed by the official ribbon cutting and Celebration Gala inside the Grand Ocean Terrace. In addition to property ownership, notable attendees included Senator Tom Davis, Hilton Head Island mayor David Bennett and Chamber of Commerce president and CEO Bill Miles. The gala unveiling event reflected the fabulous design of Spencer Special Events and performances by The Fabulous Equinox Orchestra, Voices of El Shaddai and live remote broadcasts by W.B. of Atlanta’s 94.9 The Bull added to the festive occasion.